Item hunting is one of the mayor objectives in Diablo games, besides questing and leveling. 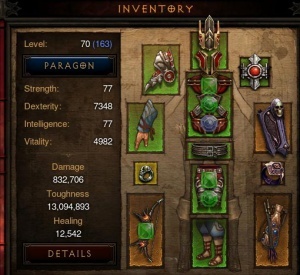 The item system in Diablo III has been simplified and streamlined, when compared to the predecessor. The loss in iconic itemization depth and replay value is arguably justified by allowing franchise newcomers to easier understand items in Diablo III. Armor refers to any non-held equipment. Most of them provide Mainstat, Vitality and other defensive bonuses. Weapons include anything held in the hand, even if they player doesn't hit monsters with it. All classes can use all types of armor, although most classes have a special type for one of the slots. Weapons are restricted by class and each class has at least one special weapon type. Ironically, the most common quality level of item drops is Rare. Grey, Normal, Magic, and Rare items are useless in Diablo III after reaching level 70. This is a massive ideology departure from Diablo II Lord of Destruction. Set items have their own color but are considered legendary in terms of drop rate. Weapons, Jewelry as well as Head, Torso, and Leg Armor can have sockets for Gems. These Gems provide additional effects, depending on where they are socketed. There are five types of Gems in a range of qualities: Ruby, Topaz, Emerald, Amethyst and Diamond. In Addition, Patch 2.1 introduced Legendary Gems that mostly socket into Jewelry and provide various effects. This page was last edited on 15 March 2019, at 17:07.